Compared to the rest of the Silverwolf/Greater Mercury output, Fat Ninja was one of the better titles, with an appealing cartoony style and a tongue very firmly in cheek. Think a slightly less-silly Tick . 1. Perry (or some other higher-up) fires Clark. 2. Clark cleans out his desk. 3. Clark starts heading for the door with his box of personal effects. 4. 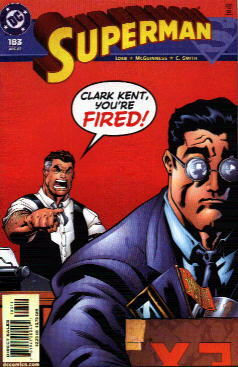 Perry pops up again to remind Clark (and everyone within listening distance) that he's fired. So, basically, Perry's a big jerk who's going to follow Clark out the door, shouting "YOU'RE FIRED" at him repeatedly, heaping additional humiliation on him during his Walk of Shame. Or maybe it's just symbolic. Yeah, I think I'd better stick with that. Really, how could I not link to something called Sterling - The Comic ? It's a 1,000 page graphic novel in progess...currently on page 57. There appears to be a fairly active forum as well. It's the Comics Weblog Update-A-Tron 3000, courtesy of Dave! Well, okay, that's not what he calls it...it's what I would have called it, so it's a good thing he did it and not me. Anyway, let this page keep you updated on when your favorite weblogs (like Neilalien) and your least favorite weblogs (like mine) get updated. Or, at least in my case, when I last revised my weblog to correct the misattributions and dumb typos. It's pretty neat, so go check it out. Permalinks not working at the moment. Haven't the foggiest reason why. Please remain calm. Do not panic. EDIT: Apparently titles are required for the permalinks to work properly. At least that's what seems to be the case, from trial and error experimentation. Oy. Looks like I have some more editing to do. Here are a few more details about that Superboy cover I posted a couple days back, via Mah Two Cents. 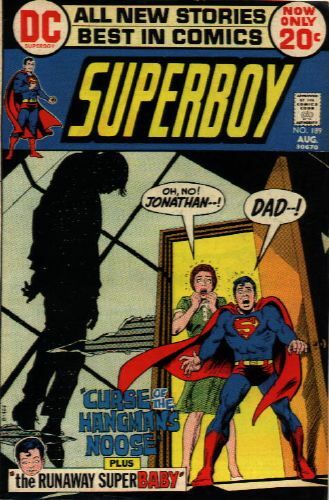 You may think you know about Superboy, but you don't know this much about Superboy. There's a whole lot more on the site's main page. 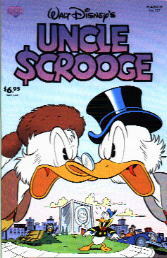 Most disappointing part of New Comics Day: having pal Dorian look at the cover of the new issue of Uncle Scrooge and proclaim "Golden Age Scrooge versus Modern Age Scrooge!" For a brief moment, I thought this was true (what with the presence of Magica DeSpell on the cover), but, alas, it's just yet another distant relation and most definitely not a time-travel Scrooge vs. Scrooge story. Rats. A couple nice items showed up today...volume two of Gyo by Junji Ito, which, if at possible, looks even more horrifying than the first volume. I'd written about Gyo before, and looking back, I realize that I never did follow up on Uzumaki . I'd better get cracking. Also arrived today was 8 1/2 Ghosts by Rich Tommaso...just grabbed it on a whim. There're ghosts, there're sordid doings, there's filmmaking, Satan is in there somewhere...I haven't read it yet, so I have no idea what's going on, but it looks to be pretty entertaining. Also took a look at a couple previews of comics shipping next week...the first issue of the Punisher movie adaptation has this winner of a last page image (SPOILER ALERT, in case you've never read a Marvel comic book in your entire life). If that's an accurate portrayal of the quality of the movie...well, consider yourself forewarned. I did read the new Swamp Thing #1 by Andy Diggle and Enrique Breccia...oh, it's good. It's practically issue #172 of the prior Alec Holland Swamp Thing series, without ignoring the intervening Daughter of Swampy stories. Pick that up next week, internet pals. Oh, and pal Dorian pointed out in the new Alpha Flight #1 that one of the characters is the son of Major Mapleleaf...isn't the death of Major Mapleleaf's son one of the main "plot" points in the "Northstar Comes Out" issue from a previous Alpha Flight series? I suppose it could be another son...but what if it isn't? What if it's Major Mapleleaf's zombie son, back from the dead to fight crime in Canada? I'd read that, certainly. Well, read it next week and we'll all find out together, I guess. Oh, and just in case you can't get into Mel Gibson's Passion movie tonight, may I suggest this viable substitute? During the early 1970s, when horror was finding its way back into popular culture, via movies, books, and television, comic books were not immune. You had Superman fighting devils, Swamp Thing and Man-Thing were hauling themselves out of their respective swamplands, the Son of Satan getting Comics Code approved (somehow), people were getting possessed left and right (like, oh, say, Ghost Rider), and, where he was cavorting with Krypto and teaming with the Legion of Super-Heroes before, now Superboy was dealing with "The Curse of the Hangman's Noose." What I like best about that cover, I think, is the inset Superbaby head between Pa's feet. And that, my friends, is what I have to contribute to the Comics Blogosphere. 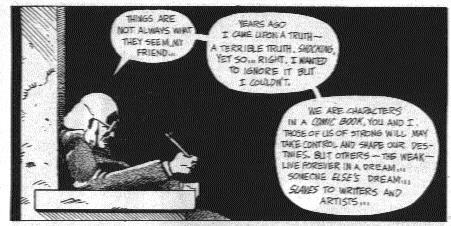 Neil Gaiman's legal battle with Todd McFarlane is over..."full steam ahead now for the Miracleman plans," sez Neil. I have the design sense of a blind man with no hands. Speaking of atrocious redesigns, I'm foolin' around with the font types and sizes on this weblog. If your eyes start bleeding, let me know. The comic series based on the Paul Dini/Bruce Timm Batman animated series is cancelled. Rats. The animated series Batman comics were the only Bat-comics I've read on a regular basis for the last decade. And what I've seen of the new animated series (in particular, the atrocious redesign for the Joker) doesn't have me interested in any comic based on it. What does Metamorpho's caveman nemesis read before acting in a movie? Something I was discussing with pal Corey earlier...all the serialized stories that ran in Action Comics Weekly that have never turned up in any collections anywhere. It may be a bit late for the Deadman stories by Mike Baron, Kelley Jones, and others, given the fate of the recent Deadman series, and that the Green Lantern serials (featuring work by Peter David and Gil Kane, not on the same stories) haven't been collected is a darn shame...but the real tragedy is that the Sunday page-style strips by Roger Stern and Curt Swan from this series are now out of print. This was good stuff...a breath of classic Superman air in the midst of the hot Byrne/Wolfman revamp gale ("he said, stretching out his really awful metaphor"). I found this mind-boggling convention sketch by Tim Vigil of the death of Green Lantern supporting character Katma Tui (an event from one of the Action Comics Weekly GL serials).